The networking installation across dentistry continues, with the last wiring install in the main clinic starting August 1. This is a critical first step in preparing clinical spaces for computing devices. The official project launch with Two-Ten Health, the vendor of Salud, is scheduled for September 5, 2017. I am excited to share with you that Two-Ten Health will be onsite, at Schulich, the week of September 18, 2017. This week will allow them to become more familiar with how we operate and finalize the information they need to configure our Salud system. You might be asked during their visit September 18-22, 2017 to participate in an information session. Please make every effort to participate. In the meantime, we are diligently working on documenting how the clinics operate. This activity is on target to finish in late August and will form the basis of how the Salud system will be configured for us. A technology team, consisting of Dentists, Dental Administration, and Information Services, has begun regular meetings. This team will conduct an in depth analysis of what the computing environment will look like in the various clinical and non-clinical areas needing access to this system. This is the start of an exciting time for Schulich Dentistry, please stay tuned for further updates and do not hesitate to ask if you have any questions or inquiries. May 2017 - The DCMS project team is pleased to announce that we have selected Two-Ten Health to provide us with our new DCMS. The software is called Salud (pronounced Saloo). Two-Ten Health (http://www.twotenhealth.com/) is an Irish company with a 25 year history of providing DCM Systems to Dental Hospitals and Dental Schools globally. 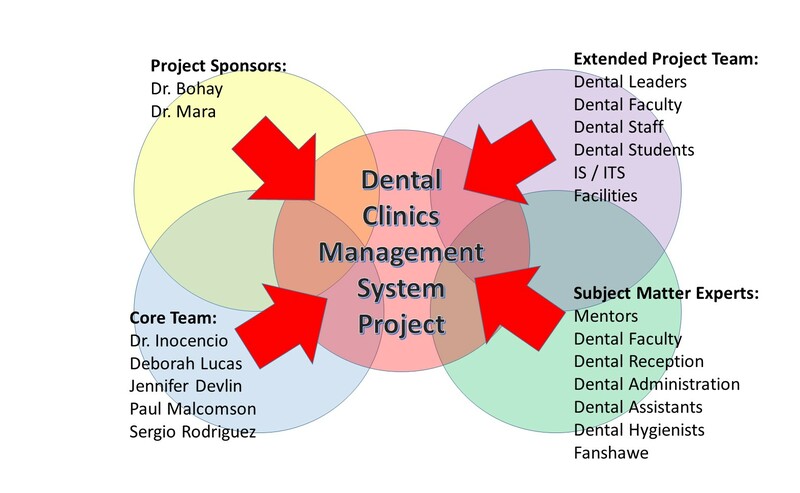 Schulich Dentistry is embarking on an exciting journey to select and integrate a Dental Clinics Management System (DCMS). This project directly and indirectly supports many of the strategic goals established by Schulich Dentistry and Schulich as a School and has a soft launch target date to be up and running by May 2018 and will be fully operational for September 2018. This project will involve most, if not all, of Dentistry. Pillar I: Clinic Readiness - this involves equipping the clinics with network connections and is scheduled to happen across the dental clinics from May to September 2017. Pillar III: System Implementation - the project team, along with faculty and staff, will work with the software vendor to design the system to best suits the needs of the School. This includes a comprehensive training plan to help you equip yourself with the knowledge to use the new DCMS system. This will start as soon as we award the vendor contract with a project kick off. A momentous initiative such as this involves more than the initial purchase and installation of the new computer system. To assist with adjustments during this process, we will be referring to a helpful comprehensive change management process (remember ADKAR? – Awareness, Desire, Knowledge, Ability, Reinforcement) to help us achieve success. Staff and faculty have been previously introduced to ADKAR as a change management process. As one of the keys to successful change management is communication, employees will receive regular communications about progress. As communication is a two-way process, your input will contribute to overall success. To support this, an email address has been created where you can submit ideas or questions: Paul.Malcomson@schulich.uwo.ca. In order to move forward, an analysis is required of how things are currently being done (“AS IS”). This allows the project team and the software vendor to understand how Schulich Dentistry currently operates and how to best adapt to the new system. This will provide the foundation to move the School into the new system while identifying opportunities for procedural improvements. Working through this project together, as a team, will produce a passionate, proud and prepared dental team.